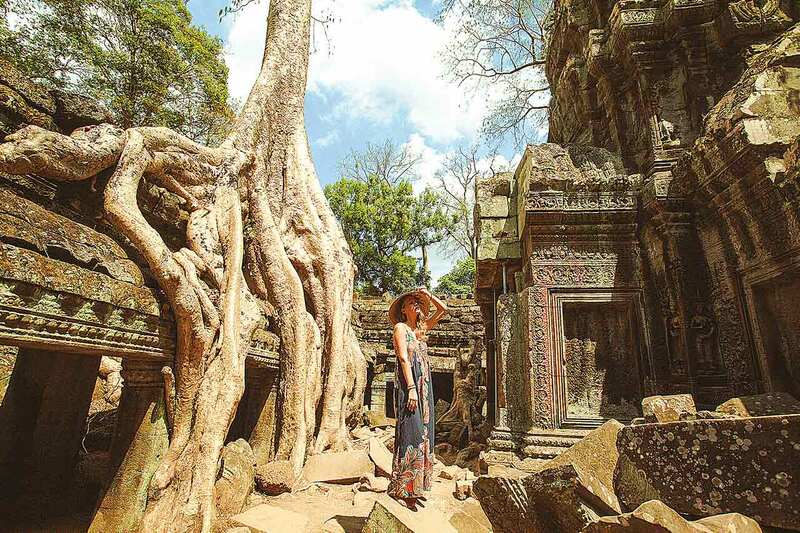 Go deep into these two great countries as you get into riverside vibes, cool waterside bars, as well taking in jaw-dropping sunrises at the likes of un-missable Angkor Wat. 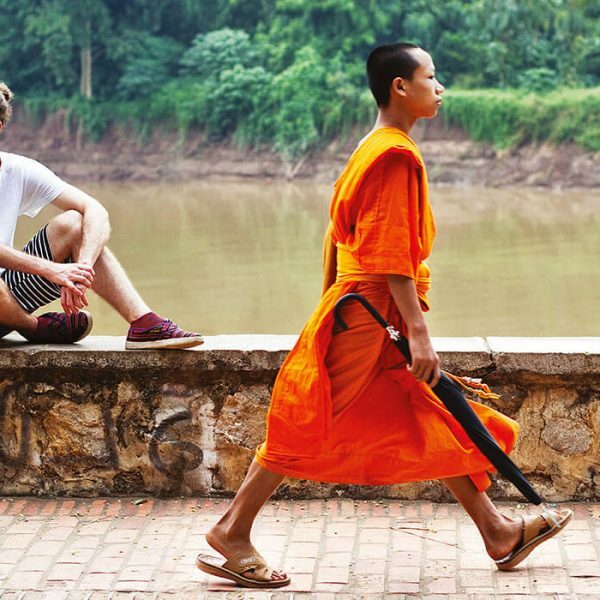 Take part in an alms ceremony in Luang Prabang, hit the streets for a bike tour, and see ancient Apsara dance performances…each day is different, and downright amazing. Was $1199. Save upto $78. The day has arrived and hello Laos! Check-in to your hotel today and get to know your Trip Manager and new travel squad as you get excited for the days ahead. It would be wrong not to watch the sunset at a riverside bar, and contemplate just how good life is and get ready for 9 days of non-stop adventure. We’ll get things a little more active with a bike tour around the alluring city that pops in to the TreadRight supported Ock Pop Tock Centre for Artisans will complete your morning. Later, then a swim under the 60-metre cascades of Kuang Si Falls could provide your daily nature fix, but most of the day is yours to visit palaces & temples & watch local life by the river, or choose to explore any way that suits. This morning early risers will be rewarded with Buddhist rituals kissed by the sun’s morning rays. Take part in a sacred Laotian ritual offering alms (food) to Buddhist monks, a bucket list experience, there’s nothing quite like seeing these peaceful locals gathering their daily meals. 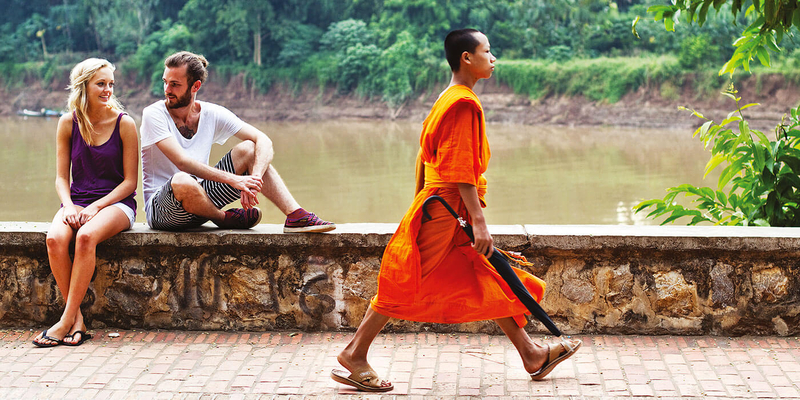 It makes leaving the charming town of Luang Prabang a little easier. Vang Vieng is known for its dramatic limestone karsts & delicious street food, Vang Vieng will keep you busy for the next two nights. Explore the local rivers and caves or chill out surrounded by like-minded travellers, watching the sun set over the mountains. Today is yours to conquer Vang Vieng. Stuck for ideas? Grab a pushbike and allow yourself to get a little lost, stopping at swimming holes and weaving through limestone caves, watching life unfold in the pretty countryside of Laos. For those keen to keep things active, you could head to some local caves for some kayaking and exploring another side of Vang Vieng. After all that exercise, a Beer Lao or two will be on the cards, so tonight, ask your Trip Manager for the best place to head for a sunset beverage, this riverside setting is the stuff dreams are made of, and tonight will be a night to never forget. Today you should wake up feeling satisfied with your Vang Vieng explorations, and ready to peel back the layers of another Laos hotspot. The capital of Vientiane awaits you. If you’re expecting a bustling Asian capital, prepare to be surprised. View the city’s very own ‘Arc de Triomphe’ and take in the city sights. Apart from seeing the beauty of Pha That Luang stupa & the artistic talent of Patuxai, we’ll use our time here to visit the COPE centre, a local charity that provide prosthetic limbs and rehabilitation services to those who have lost their limbs as a result of unexploded land mines. Our visit here will also provide an insight into Laos’ troubled history. This morning we cross the border sky high, flying out of Laos as we make for the capital of Cambodia. Although it’s easy to find reminders of Cambodia’s dark past in the city of Phnom Penh, it is also a place brightened by shy smiles and pretty tree-lined streets. We’ll learn about the horrific Khmer Rouge rule by visiting the mass graves of the ‘Killing Fields’ & the Tuol Sleng Genocide Museum with our Local Guide. With knowledge in hand, we’ll lighten the mood by paying a visit to the Tree alliance restaurant, where disadvantaged and former street children are trained up in hospitality skills. And wow, do they do it well; their frozen shakes and mouth-watering menu never fail to impress. Later tonight, the night is yours to explore as you please. Another included flight takes us out of Cambodia’s capital this morning, landing us in the heartland of an ancient masterpiece and what is still the largest religious monument in the world. You could relax poolside this afternoon, before seeing what’s going on by night! There are plenty of things you could spice up your night with, like local night markets though probably best to reserve your energy for our early morning visit to an Eighth Wonder of the World and something we know you’ve all been waiting for. Prepare to be moved to the core this morning as we journey to Angkor Wat through dawn’s hours in preparation for sunrise. Nothing can quite describe the feeling of watching the day’s first rays touch this ancient spiritual site, it’s pretty much magic. 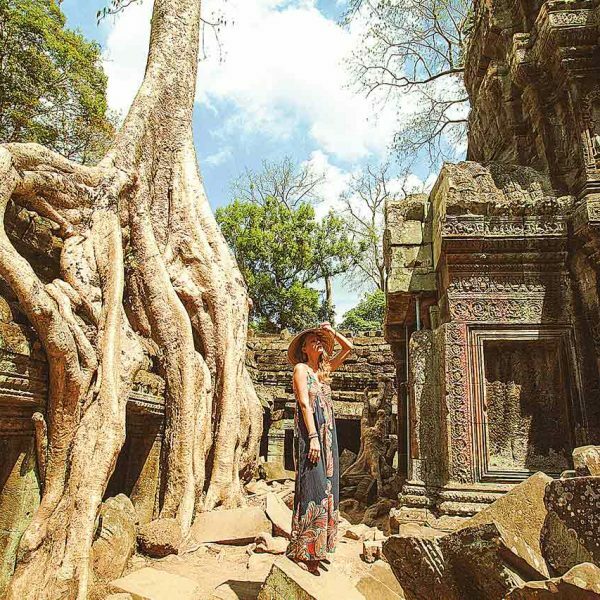 After a siesta and pool hangs to break up the day back at our hotel, we journey back to the temples to explore Angkor Thom and the Tomb Raider temple of Ta Prohm, which is slowly being swallowed by the jungle. With no early rise on tomorrow’s agenda, we can let loose on the city’s famous Pub Street and the buzzing local night markets. We came, we saw, we did it all! After one final delicious Asian breakfast together it’s finally time to say goodbye (sob). Team, it’s been epic.